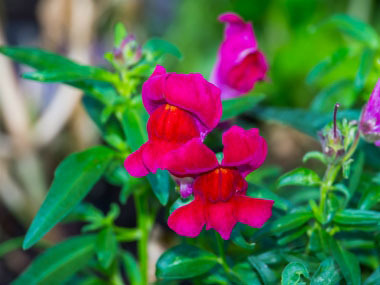 The snapdragon is an old garden favourites that, in optimum cool summer growing conditions, will flower well from spring to autumn. In climates with protracted hot summer weather, plants often tend to languish and may not last the entire growing season. The common name is in reference to the dragon-shaped, tubular, two-lipped, closed flowers that appear in terminal racemes. 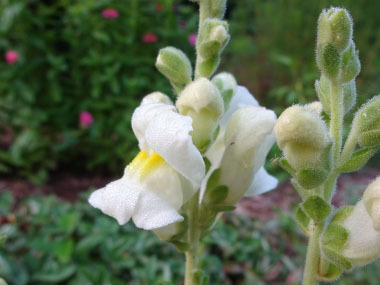 Snapdragons can taste bland to bitter depending on type, colour, and soil conditions. Although edible, adding only a few in a salad is best. 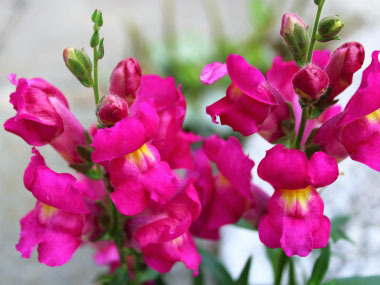 Fields of Nutrition has medicinal benefits and vitamin/mineral content of Snapdragon. 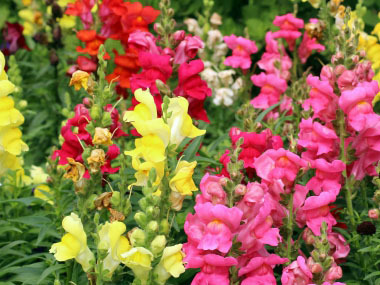 Colours: Snapdragons occur in a beautiful spectrum of red, yellow, pink, and white flowers. Height: 30cm to 1m (1" to 3"). Medicinal qualities: According to Plants for a Future, the leaves and flowers are antiphlogistic, bitter, resolvent and a stimulant. They have been used in poultices on tumours and ulcers. It is effective in the treatment of all kinds of inflammation and is also used on haemorrhoids. Snapdragons are harvested in the summer when in flower and is dried for later use. Dye: The flowers produce a green dye without a mordant. Dark green and gold can also be obtained if a mordant is used.